Here it is…the first pumpkin recipe post of the season! 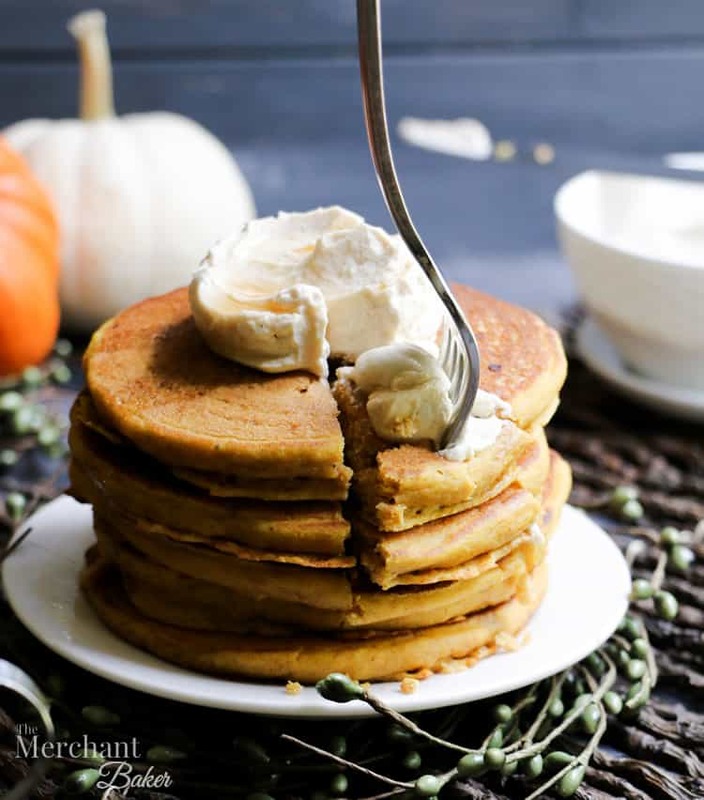 I’ve been waiting since last year to share these Fluffy Buttermilk Pumpkin Pancakes with you. We eat pumpkin year ’round so I suppose I didn’t have to wait until pumpkin season to share them. 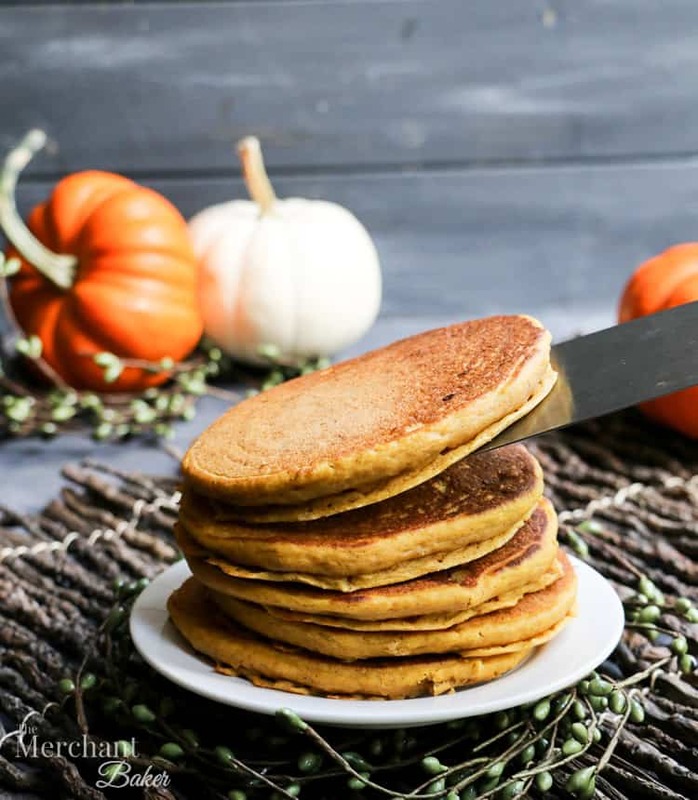 But with all of the years we’ve had of pumpkin spice overdrive, I figured I’d wait until pumpkin season actually arrived to present you with my latest pumpkin pancake recipe. 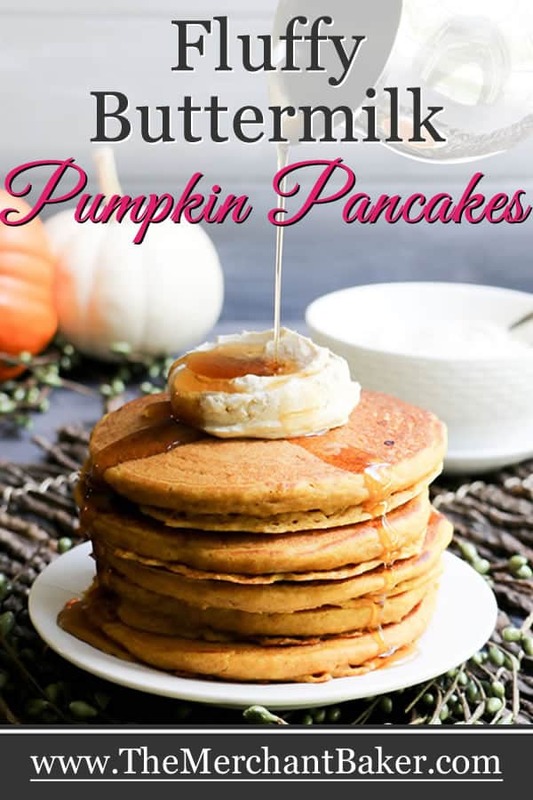 I say “latest” because when my kids were younger, I was experimenting with all kinds of pumpkin pancake recipes. 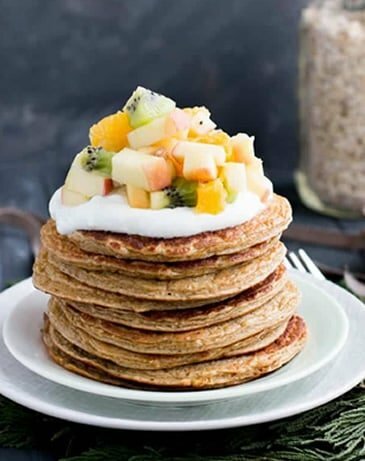 For the most healthy version, I would pack the pancakes with whole wheat and wheat germ and ground flax seeds. 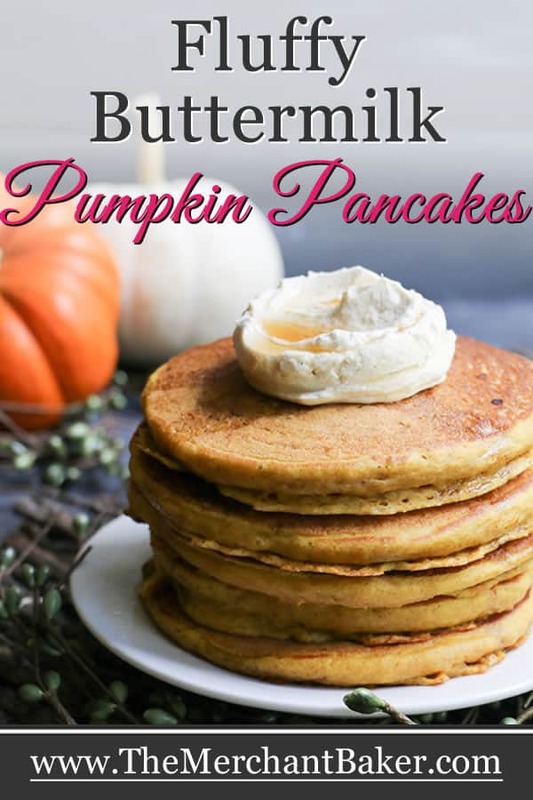 When I was in a hurry, I would simply start with a prepared pancake mix and add my pumpkin and spices. Believe me when I tell you I’ve made hundreds and hundreds (maybe thousands?) 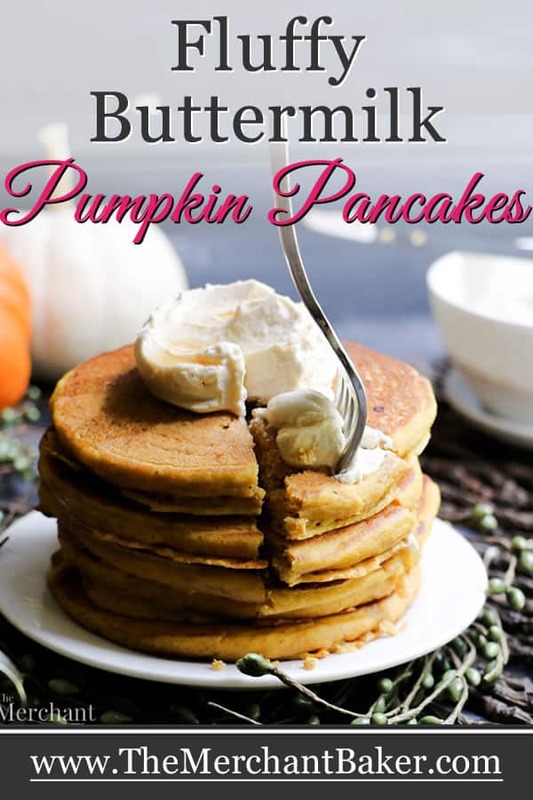 of pumpkin pancakes in my life. 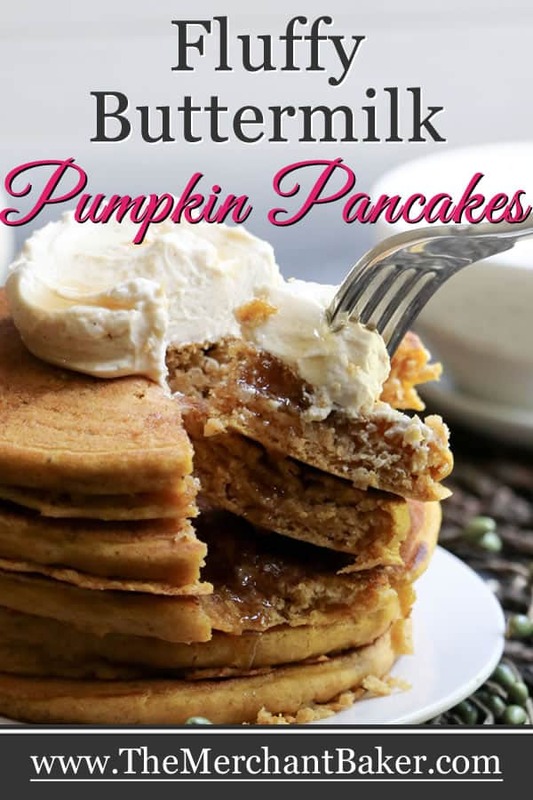 However, I was never perfectly thrilled with my from scratch pumpkin pancakes. They always tasted good, but I am a texture freak and I wanted a specific texture that I wasn’t getting. That was before I worked on my original Fluffy Buttermilk Pancakes. That’s a great base recipe to have on hand. 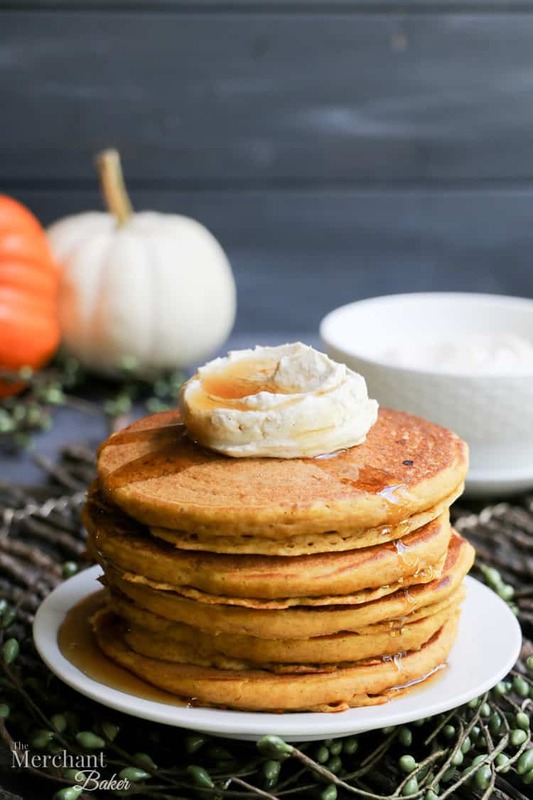 Once I had that one solved, I used it to develop these Fluffy Buttermilk Pumpkin Pancakes for you. They turned out perfectly! 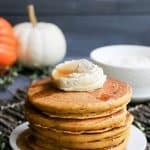 I finally had a winner of a pumpkin pancake. 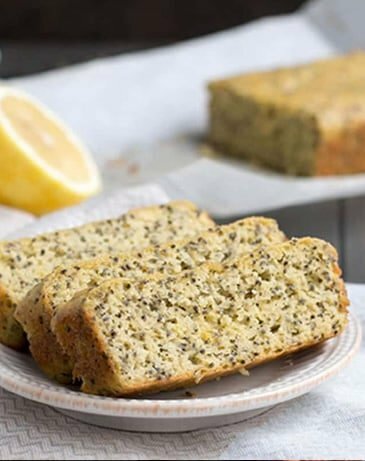 And no, they weren’t chock full of wheat germ and flax seed, but they were still whole grain. 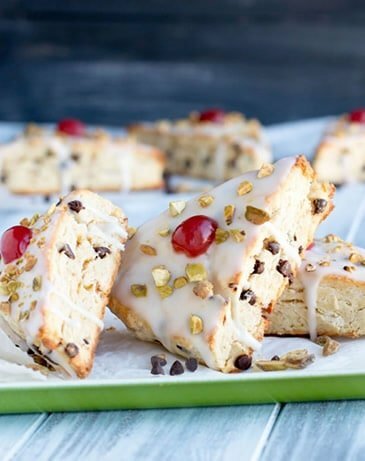 Of course, the recipe can be modified to add all kinds of good stuff, if you wish. One of the things I’ve learned about making whole wheat pancakes is that the secret is in the flour. I used to go 50/50 using all purpose and whole wheat hoping not to have too much of a heavy wheaty taste or texture. The solution to that is whole wheat pastry flour. There’s no need to go 50/50. I use it as the only flour in a whole wheat recipe and it works perfectly. No one ever suspects that it’s whole wheat! You’ll find whole wheat pastry flour with the rest of the flour in the baking aisle. Sometimes you’ll find it in the organic baking section of the grocery store. I generally buy Bob’s Red Mill. I found this little video to share with you that explains how their whole wheat pastry flour is different than regular whole wheat flour. 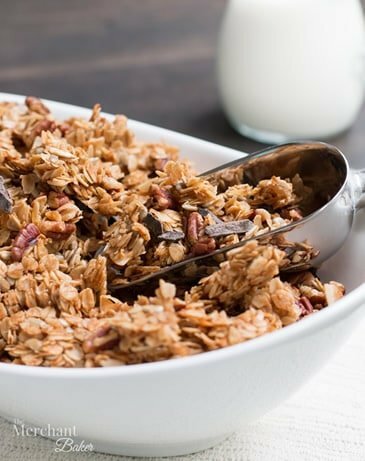 If you’re not a fan of whole wheat…feel free to use all purpose flour. 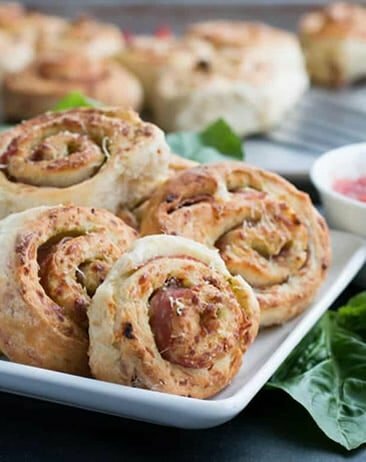 As it turned out, I didn’t have enough of my whole wheat pastry flour and made up the difference with all purpose flour when I shot this recipe. That’s right… I would freeze them and have them ready at a moments notice. You know I love leveraging my cooking time. Pancakes and waffles freeze beautifully, so I always make big batches. 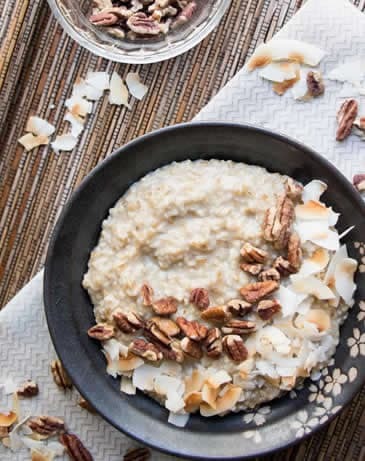 Ditto for brown rice and white rice. Even though rice is a piece of cake for me to cook on a moment’s notice, I love being able to open up the freezer and see a bag ready and waiting to be used for that evening’s dinner. For those of you want to hop on the big batch and freeze bandwagon, let me tell you how I do it. It’s pretty simple. You’ll need waxed paper and gallon size zip top freezer bags. I use the waxed paper to keep the pancakes easy to separate once they’re frozen. My pancakes are about 4-5″ wide. So, I tear off strips of wax paper about that width. In the beginning, I would cut squares from the 4″ width strips of waxed paper and place a square in between stacks of cooled pancakes. Just place a cooled pancake on one end of the waxed paper strip, fold the strip over the top of that pancake and place another pancake on top. Then, fold it back to cover that pancake and stack another pancake on top. Once you’ve filled the bag, squeeze out any excess air and zip it closed. I always date the bag and insure I use them within 2-3 months. In reality, they’re generally gone much sooner than that. Why? Because when you’re in a hurry in the morning, and you know that breakfast is ready to reheat at will…well, who wouldn’t want to press the easy button and just reheat a stack of pancakes? 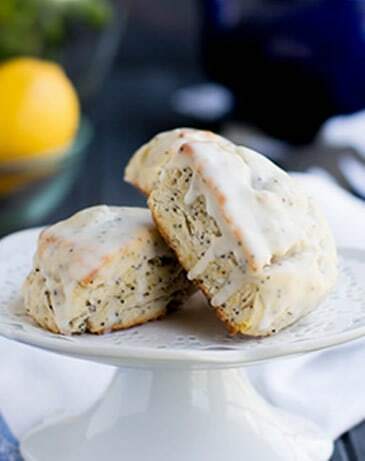 You can reheat them from frozen or you can plan ahead and thaw them overnight in the fridge. In either case, I reheat them in the microwave in a single layer on a microwave safe plate. Generally, I let each person reheat their own as they arrive for breakfast so that their pancakes are piping hot and ready to top. 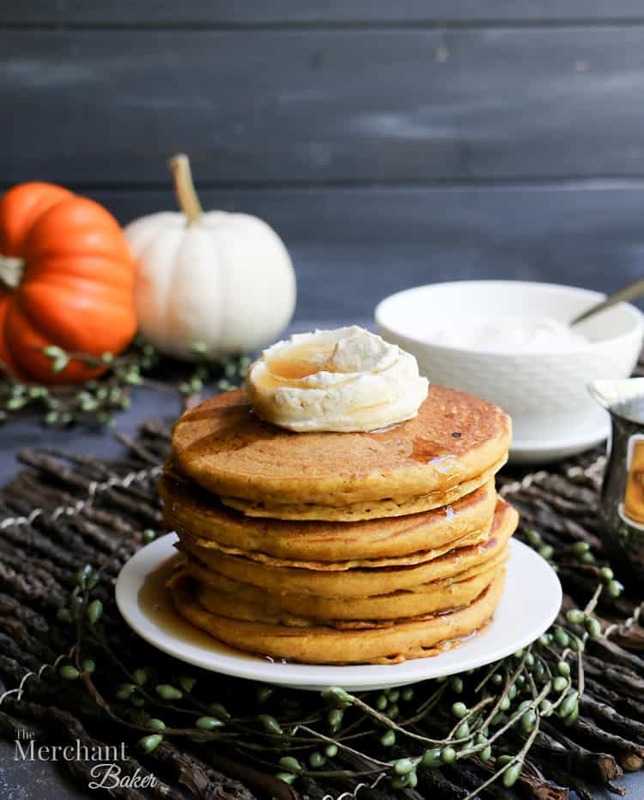 Now you could top these Fluffy Buttermilk Pumpkin Pancakes with butter and syrup and they’ll be just fab. But, you know I generally try to give you some fun options when it comes to topping your pancakes. For instance, remember the lemon curd whipped cream for my Gingerbread Pancakes and fresh citrus syrup for my Orange Pancakes? I didn’t have to think to hard to decide what would top these delicious pancakes. Do you know about my incredibly popular Whipped Cream Cream Cheese Frosting? 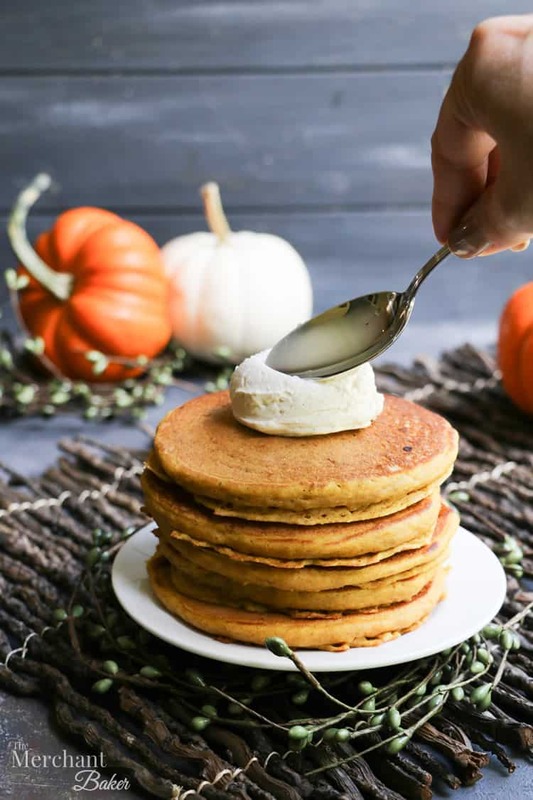 Well, if you know about that frosting or have watched the video or have read the post or any of my responses to the hundreds of comments on that post….you’d know that when we have leftovers of that frosting, we LOVE to top pumpkin pancakes with it! Today, I’m not using any leftover frosting. Today, I’m making a special flavored batch specifically for these pancakes. I made just a few adjustments in the ratio of the frosting, reducing the sugar a bit. Then, I used brown sugar instead of white sugar to give it a hit of caramel flavor. I added some spice and voila! Brown Sugar Spiced Cheesecake Topping! 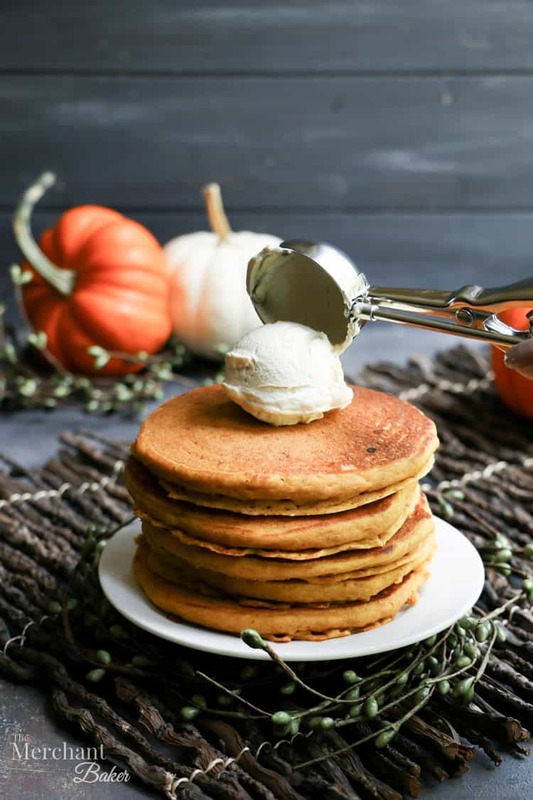 We’re already huge, HUGE fans of the original recipe, so I knew we would LOVE this new version as a topping for our pancakes. But here’s the thing…I wasn’t sure how much topping to make. At first, I thought I would make enough for a generous scoop on top of stack of three pancakes. Then, knowing how much everyone loves this frosting, I thought I’d better make more. I figured we never have an issue with leftover frosting, so if it was too much, I knew it wouldn’t go to waste. That stuff is good on everything! In any case, I didn’t need to worry about making too much. I wasn’t in the kitchen when everyone was making their stacks and getting ready to eat. 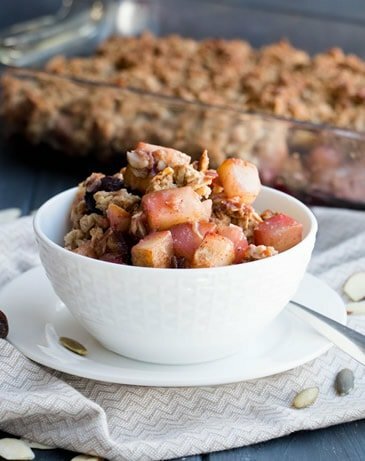 When I actually did arrive in the kitchen, I shouldn’t have been shocked to see that the topping was being spread generously between every…. single… pancake… layer. 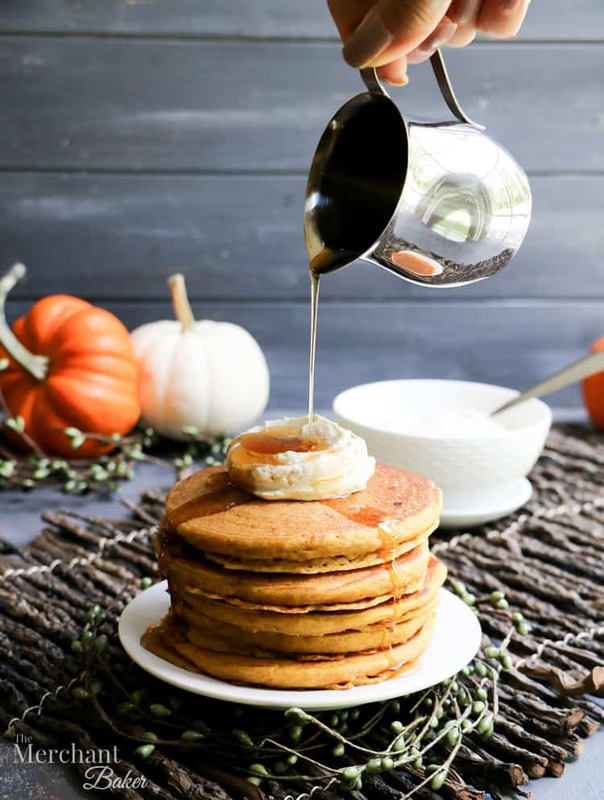 My kids (and seriously, my husband too) were gleefully heading from the kitchen to the table transporting their loaded and stacked pancake creations! 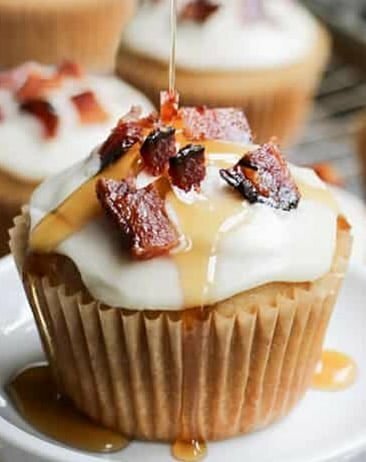 Of course, I had planned to serve it with a dollop of topping and some syrup, you know, just like my photos. I should have predicted the enthusiasm they would have once they saw that I made a whole bowlful of Brown Sugar Spiced Cheesecake Topping just for this batch of pancakes. Oh well, chalk it up to a splurgey breakfast. 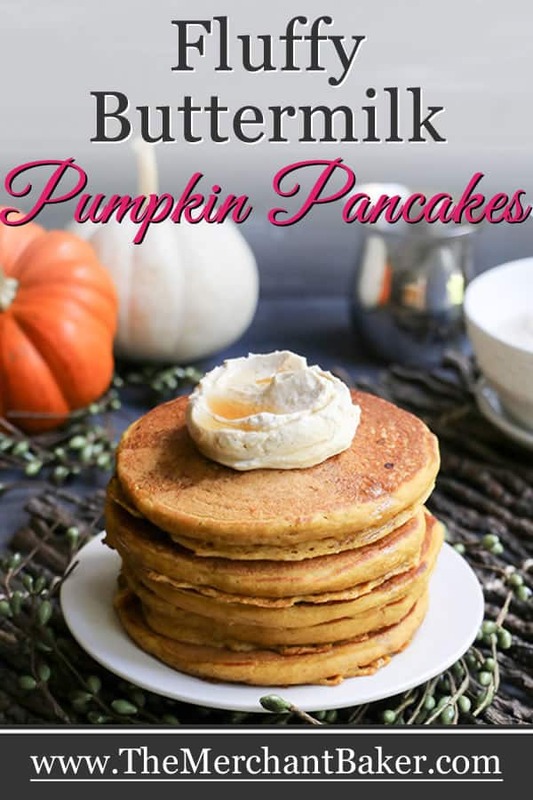 At least the pancakes were full of nutritious pumpkin and they were generally whole grain. 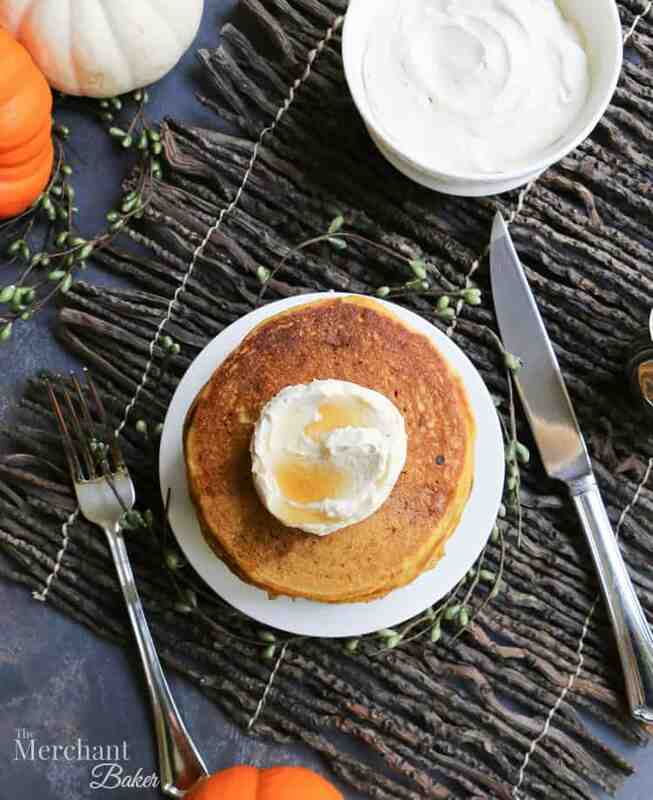 But honestly guys, these Fluffy Buttermilk Pumpkin Pancakes are the bomb! So, so good. The topping takes them right over the top and back again. Trust me on this. You’ll be in heaven. 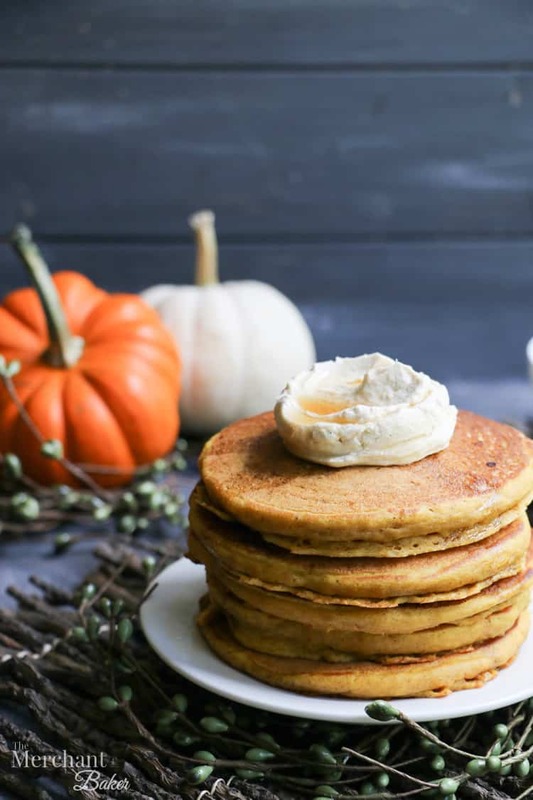 So there’s a reason we like to eat all things pumpkin all year round. Preheat griddle to medium. I heat mine to 340 degrees F. If using a frying pan, you can wait until your batter is mixed up before preheating. Whisk flour, baking powder, baking soda, salt and pumpkin pie spice in a large bowl. In a four cup liquid measuring cup, whisk together sugar, pumpkin, eggs and olive oil until well blended. Add enough buttermilk to bring the entire mixture to 4 cups. Whisk to thoroughly combine. Pour buttermilk mixture into flour mixture and whisk to combine. Do not over mix at this stage or you'll risk tough pancakes. Lumps are okay. Just mix until the dry ingredients have been incorporated. 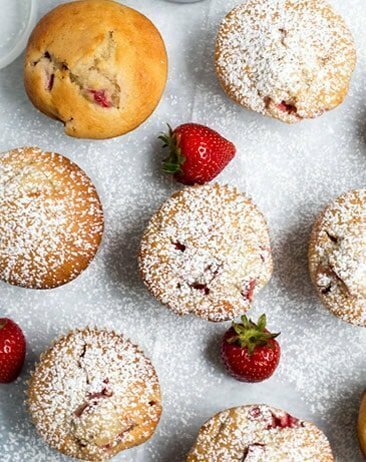 Allow batter to rest for 10 minutes. Drop batter by 1/4 cup scoopfuls onto preheated griddle or preheated pan sprayed with cooking spray. This is a thick batter, you may need to use the back of your spoon or scoop to help them spread. 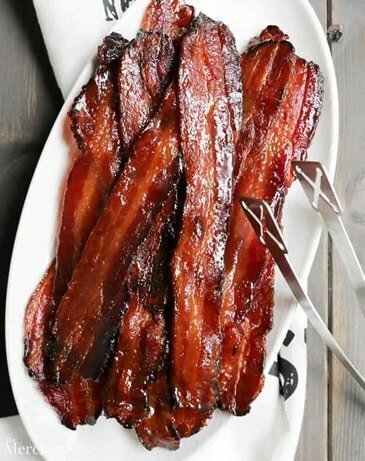 Cook for about 2 minutes per side, or until sides are set and you're beginning to see bubbles and the bottom is golden. Flip and finish cooking the other side. 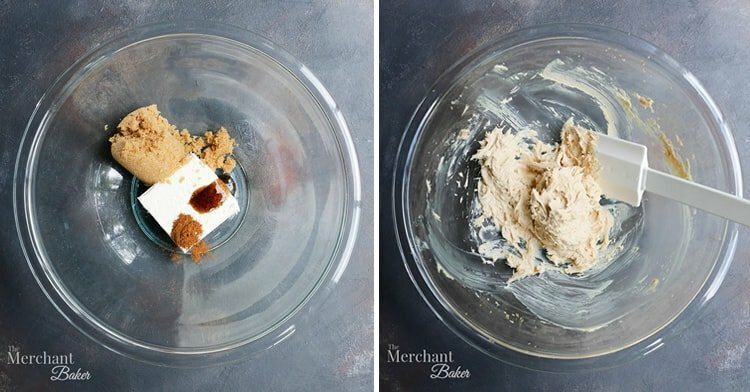 In a medium bowl, with an electric mixer, blend the cream cheese, brown sugar, vanilla paste and spice until well combined. (See photos in blog post to see what this stage looks like.) It should only take a minute to mix it up. 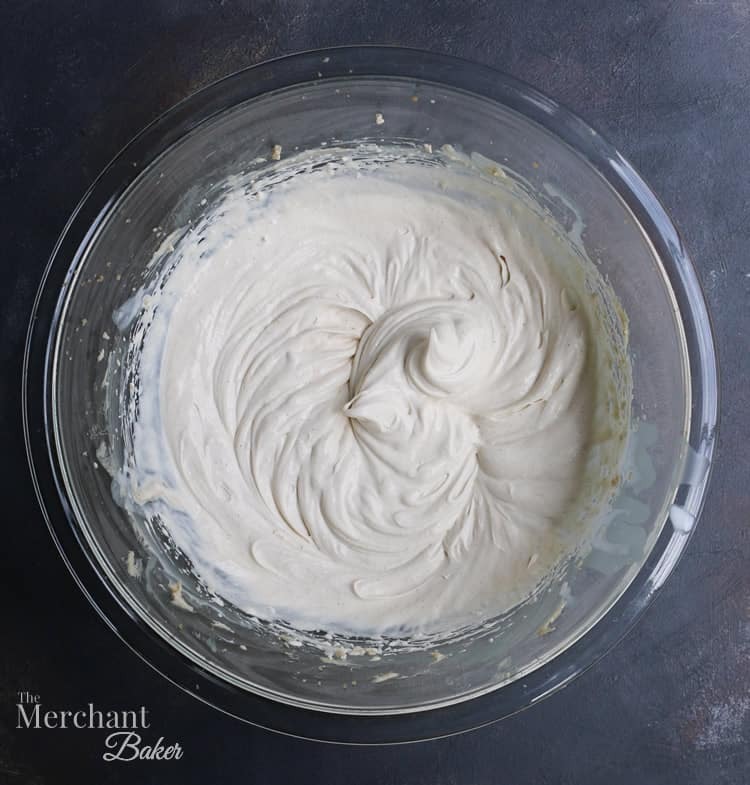 While beating on low, slowly drizzle the heavy whipping cream down the side of the bowl (this helps prevent splashing) until the cream has been incorporated into the cream cheese mixture. As the mixture thickens, slowly increase the speed of the mixer and whip to soft or stiff peaks. Soft peaks will give you a nice texture to dollop, stiff peaks will allow you to pipe the topping, if you desire. *All whisks are not created equal. Some have more wires and some have less. This is a thick pancake batter. I don't use a whisk to incorporate air, but I like how it breaks up the lumps while I'm stirring. If your whisk has lots of tines, the batter will get caught up in it. Feel free to stir with a spoon or spatula if you don't have a whisk with few wires. *This is a thick batter and won't automatically spread on the griddle like a thinner batter would. After scooping it onto the griddle, I use the side of my scoop in a light bouncing motion on top of the batter to help it spread into a circle. 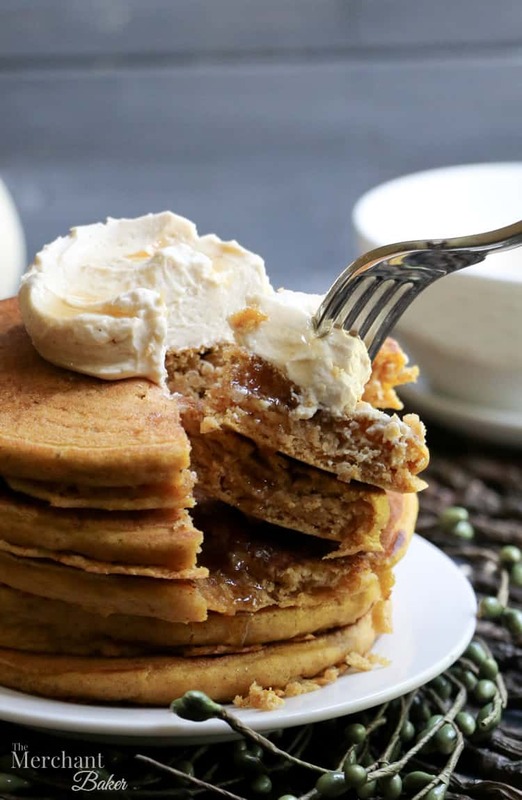 *The topping recipe makes enough for a generous dollop on stacks of pancakes. 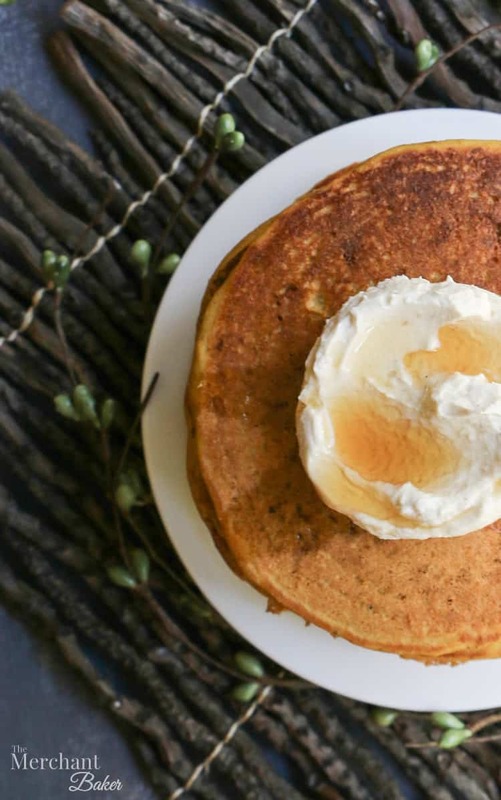 If you're looking to top every individual pancake, you should probably double the topping recipe. *Leftovers of the topping can be stored overnight, covered, in the fridge. It will lose some of its body overnight, but you'll simply get softer dollops. If you decided to go for stiff peaks and put it into a piping bag, just place the whole piping bag with tip still attached into a tall mug, jar or glass (tip facing down) and cover with some plastic wrap. You'll still be able to pipe it the next morning, but the edges will be softer. 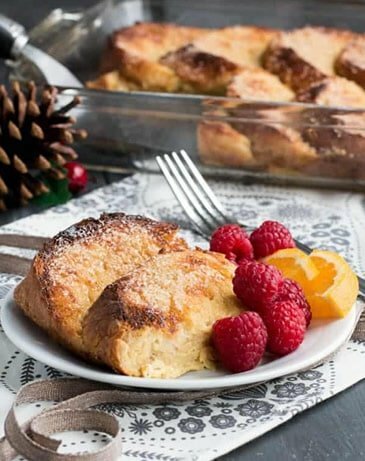 *Store leftover pancakes covered in the refrigerator or freeze for longer storage. 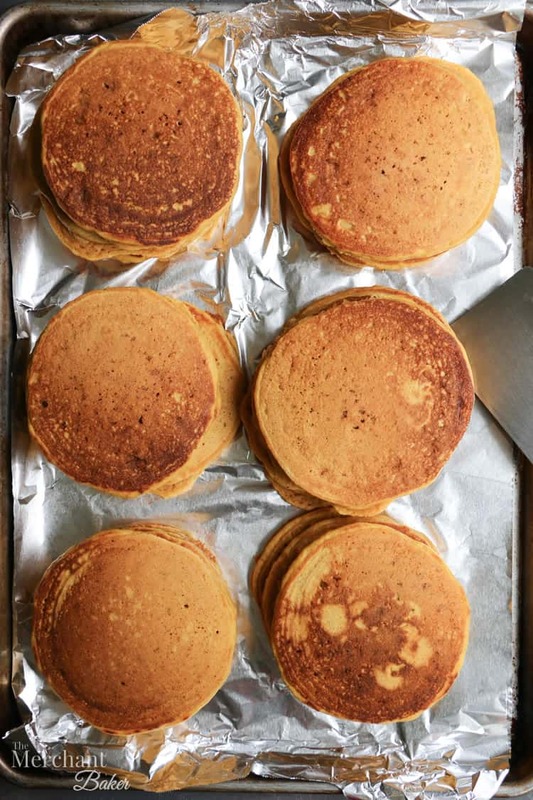 Frozen pancakes reheat beautifully in the microwave. Just separate with waxed paper and freeze in zip top freezer storage bags. See post for more details. *If you want more tips on how to make great pancakes, check out my Fluffy Buttermilk Pancakes post.